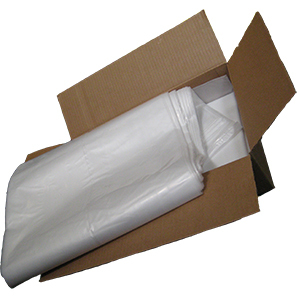 PRODUCT: 14" x 22" x 60", SQUARE BOTTOM, 60+ GALLON, CLEAR, 2 MIL THICK PLASTIC CONTACTOR BAGS. 100 BAGS/CASE. PRICE/CASE. DESCRIPTION: THESE OVERSIZED CLEAN-UP BAGS ARE IDEAL FOR JOB SITES OR AS A DRUM LINER. THE EXTRA STRONG SQUARE BOTTOM ALLOWS MORE CAPACITY.